For those looking to solve complex transport process problems involving photonics and microfluidics, it can be challenging to account for all of the elements involved, including multiple physics phenomena. However, this is necessary for accurate results. By using multiphysics simulation, Carl Meinhart from the University of California, Santa Barbara and Numerical Design, Inc. accurately modeled transport processes in two application areas: high-frequency acoustics and microfluidic valves. Watch his keynote talk from the COMSOL Conference 2016 Boston to get the details. 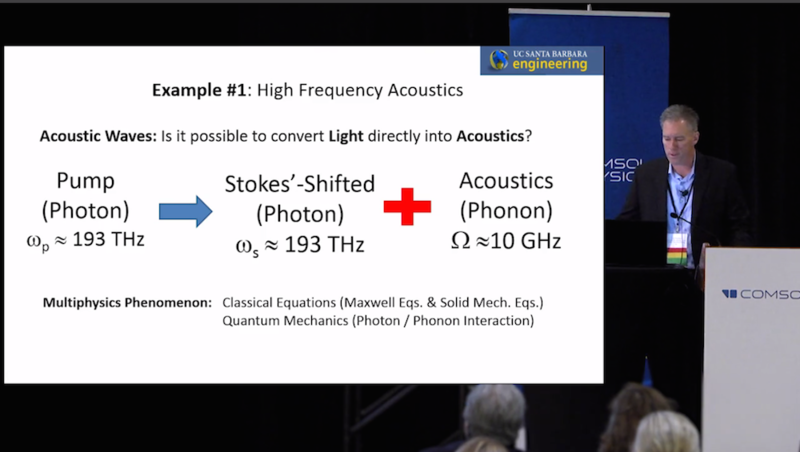 From the video: Carl Meinhart discusses a theory behind converting light into acoustics. While the idea was originally predicted in the 1920s as Brillouin scattering, it wasn’t observed until the 1960s. Modern researchers can now turn to the COMSOL® software to analyze this theory and all of the relevant multiphysics phenomena. For a specific photonics example, Meinhart examines an innovative design from the Vahala Research Group at Caltech, a pioneer in this field. The Vahala Research Group designed an optical ring that uses whispering gallery modes for the ring instead of guided waveguides. Meinhart explains that when simulating this kind of device, “it’s very important to design the optics and the acoustics simultaneously,” a task that can be achieved with multiphysics simulation. Through their research, the team found that their design has a very high Q factor. Research like this indicates that very sensitive high-Q resonators can be built by combining photons, phonons, and the concept of Brillouin scattering. To try this sort of simulation yourself, download the example Meinhart mentions in his presentation, the Optical Ring Resonator Notch Filter tutorial. Next, Meinhart turns to an industry example: maximizing the speed of a microfluidic valve. When looking to increase speed, a researcher’s first move is often to decrease inertia by making their design light and small. However, physical prototypes of small devices like microfluidic valves are expensive and time consuming to create and difficult to measure experimentally. 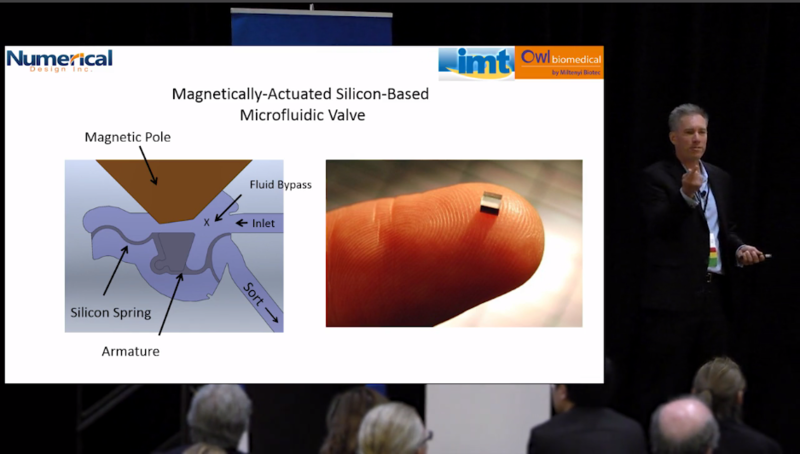 From the video: Carl Meinhart shares the example of a magnetically actuated microfluidic valve (left) and its approximate real-world size (right). 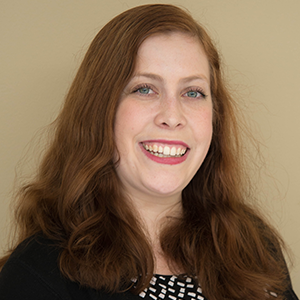 For a concrete example, Meinhart considers a microfluidic valve being commercialized by Owl Biomedical, Inc. To increase their microvalve’s speed, the group tried using magnetic materials and thin silicon, which bends well and is a high-Q material. The resulting magnetically actuated device can be evaluated by importing the complicated geometry into COMSOL Multiphysics® using a product like LiveLink™ for SOLIDWORKS®. Then, researchers can analyze the design by combining nonlinear magnetics, fluid-structure interaction, and particle tracing simulation studies. Initial results revealed that this microvalve design contained nonoptimal flow patterns. But, by using simulation to modify the shape over many iterations, researchers can balance the spring forces and optimize the flow and opening and closing speeds. The result? An incredibly fast microfluidic valve design that, when used to create a cell sorter, can sort 55,000 cells in 1 second or 200 million cells per hour. This optimized design has the potential to revolutionize cell sorting through Owl Biomedical’s cell sorter. To learn more about how Carl Meinhart uses multiphysics simulation to study transport processes in photonics and microfluidics, watch the video at the top of this post.